We recently discussed the oil and natural gas industry’s involvement with wildlife conservation efforts around the United States. Closely linked is industry’s effort in the protection of plants and habitats, too. Protecting our habitats is something industry has championed for some time. Back in 1987, Occidental Petroleum came across a rare looking plant on one of its drilling sites in Colorado. The plant, later identified as the parachute penstemon, can only be found in Colorado and is considered one of the rarest plants in North America. Realizing the importance of the discovery, Occidental forged an agreement with the Colorado Natural Areas Program to protect and monitor 360 acres of Occidental land, which became home to the largest population of this rare plant in the world. It’s one example of the oil and natural gas industry’s commitment to creating and preserving spaces for plants and trees to thrive. From new habitats in cities to dedicating large areas for rehabilitation and restoration after energy operations are completed, our industry recognizes the value in preserving green spaces for future generations. In Anadarko’s Greater Natural Buttes Field in Utah, the company identified the Uinta Basin hookless cactus on its site. This relatively small cactus, less than 10 inches in height, produces a vibrant pink flower in the center. It can only be found in a fairly small geographic area along the Green and White rivers in Utah. In 1979 it was classified as a threatened species under the Endangered Species Act. Anadarko now is working with the U.S. Fish and Wildlife Service and Utah State University to study it. So far, the company has committed $100,000 to the project and pledged an additional $300,000 to further the study. In Wyoming, Anadarko has partnered with the Bureau of Land Management on a multi-year program to rid the Powder River Basin of invasive species and noxious weeds. Together, they’ve treated more than 8,000 acres to help restore native plants, creating a healthy ecosystem for the elk herd and other native wildlife. Invasive plant species are a major threat , threatening entire native habitats and ecosystems. 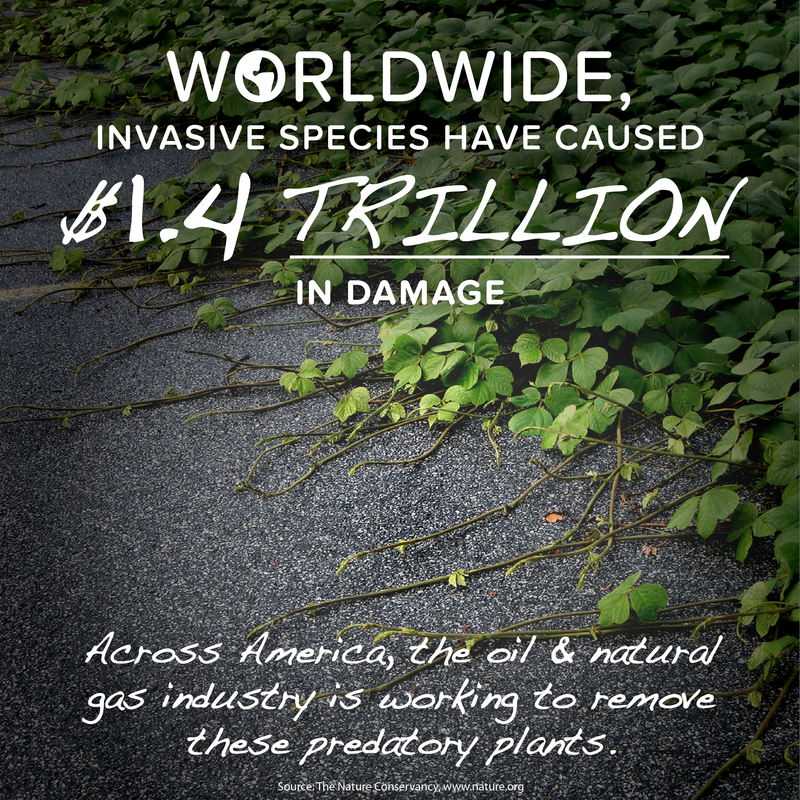 The Nature Conservancy estimates that globally invasive species have caused up to $1.4 trillion in damage. In Houston, ExxonMobil acquired a 385-acre site as the location for its new campus of more than 20 state-of-the-art, energy-efficient buildings. With planned structures occupying less than half of the acreage, approximately 195 acres will be set aside as green space, including ravine forest, riparian zones, swamp forest, managed terrestrial landscape and two constructed lakes. In addition, an early survey of flora on the site identified 343 ecologically valuable trees, including a majestic Shumard oak, estimated to be 150 to 200 years old. Building construction focused on open spaces, so that 213 trees can stay where they are. The additional 130 trees, including red oaks, winged elms and southern red oaks, were relocated elsewhere on site. Along the Gulf Coast, in Garyville, La., Marathon Petroleum Company set aside 450 acres of the Garyville Refinery site for local flora and fauna. The site, which is certified as a Wildlife Habitat Site by the Wildlife Habitat Council, was designed to reinforce the natural beauty of the area. To do that, Marathon tested the area’s soil and hydrology to determine the ideal wildflower species for the area. The result is a beautiful, diverse green space surrounding the site as well as the creation of new habitat for local birds, insects, mammals and bees. In Washington state, more than 1,800 acres of BP’s Cherry Point Refinery on the eastern shore of the Strait of Georgia are actively managed wildlife areas. BP worked to create approximately 100 acres of wetlands, including downed logs, artificial snags and brush shelters. In 2009 and 2010, more than 73,000 native plants were rooted along with more than 6,000 trees. Following the habitat restoration, observers noticed an increase in amphibious life at the site. In 2013, BP’s team began a monitoring program to document the wildlife appearing on the site. The program has since been expanded and now teaches volunteers how to identify species while educating them on proper habitat maintenance. Along the Gulf Coast, industry is working closely with America’s Wetlands Foundation to protect and restore coastal Louisiana. Entergy partnered with the foundation to study how to reinforce and protect the coastal area. Following the study ConocoPhillips, Chevron, CITGO and Shell worked with the foundation on a $1 million project testing ways to counter erosion along a 1-mile stretch of the Gulf Intercoastal Waterway. The installation was completed earlier this year, and now the plantings will be evaluated prior to continuing the project in subsequent areas of the waterway. In the Gulf of Mexico, a number of platform operators have turned to the Interior Department’s Rigs-to-Reef Program at the end their facilities’ use. The program was designed to reuse offshore platforms by turning them into artificial reefs across the Gulf. This creates more habitats where marine life can thrive and saves companies the cost of dismantling and scraping the rigs. More than 400 applications for the program have been approved so far. Rather than being dismantled, these structure are now creating a habitat for marine life. The structure of the platform is unique in that its hard surface provides a needed home for coral to grow. 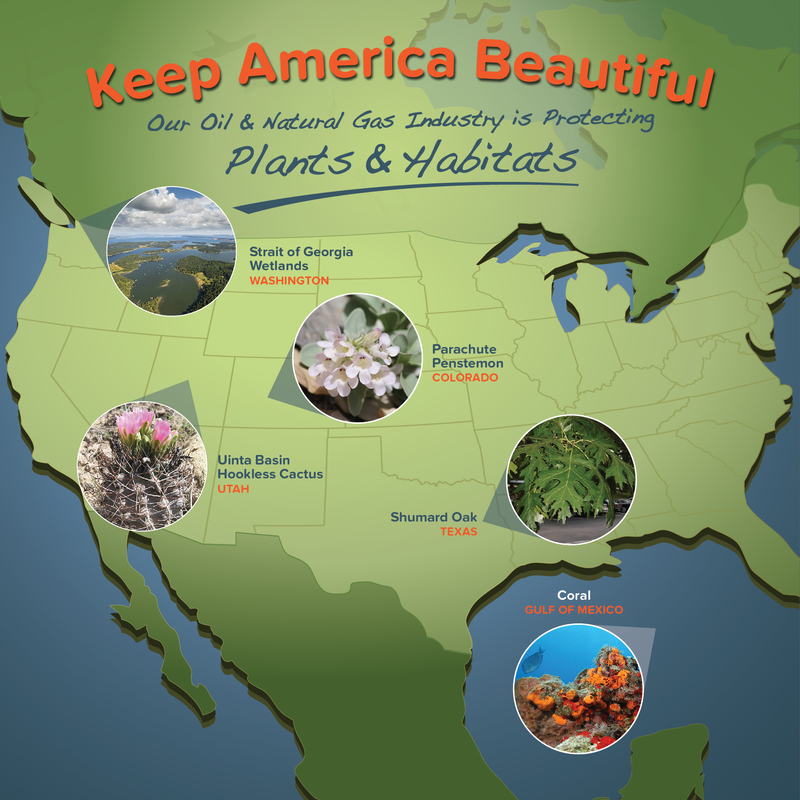 The oil and natural gas industry is committed to protecting America’s open lands. From shielding endangered plants to creating open spaces in local communities and restoring vital wetlands, industry is working to preserve natural environments for both neighbors and wildlife to enjoy for many years to come. Kate Wallace is an associate of research and content development for the American Petroleum Institute. Before joining API she was a researcher and policy analyst at America’s Natural Gas Alliance, and worked on pollinator conservation programs and state wildlife conservation policies before entering the energy industry. Kate graduated from the University of Connecticut with a bachelor’s degree in Resource Economics, and earned her Master of Public Administration from George Mason University. She loves taking her dogs on hikes, travelling and navigating the northern Virginia/DC craft beer and wine scenes with her friends and family.